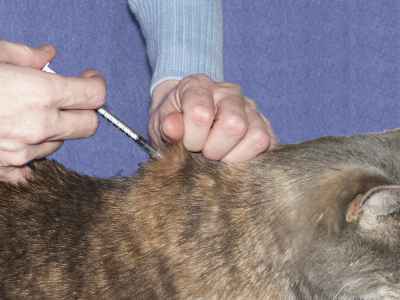 A picture may paint a thousand words but nothing can take the place of face to face instruction - if you have any doubts about your injecting technique, please go and see your vet. You’ve probably seen a mother cat carrying her kittens around by the scruff of the neck - it’s this scruff part that you inject into. Or to be more precise, the hollow bit underneath it. I have heard that you can inject into any area where there is loose skin, but I found that anywhere other than the scruff area made the cats squeal. It’s all very well showing you a nice black and white picture of where you’re aiming for, but I know only too well that it is rather different on a living, furry, squirmy cat! There are a number of methods of injecting, it’s just a matter of finding what works for you. This is the method I use. 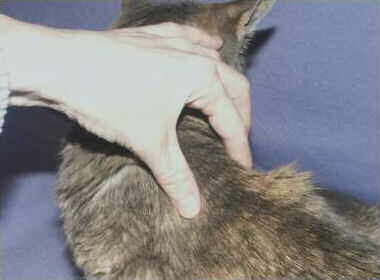 Start by finding your cat’s shoulders. I use my left thumb and middle finger and run my hand up the shoulders until I have a roll of skin between my thumb and finger. 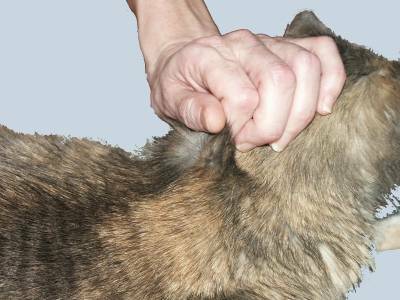 Aerial view of finding the shoulders and using thumb and middle finger to get a roll of skin. Then, using the same thumb and the side of the index finger I gently get hold of a good bunch of fur at the top of the roll of skin. I do it this way because you can actually see the skin beneath and it makes it easier to ensure that you’ve got the needle in! Gently lift up, away from the shoulder blades so that there will be a hollow between the skin and the tissue and muscle underneath. Gently and smoothly push the needle into the skin, making sure that you’ll just be squirting the insulin into the empty "cave" you made. Push the plunger and you’re done! Above is another photo of the actual injecting into the scruff, but from a different angle. 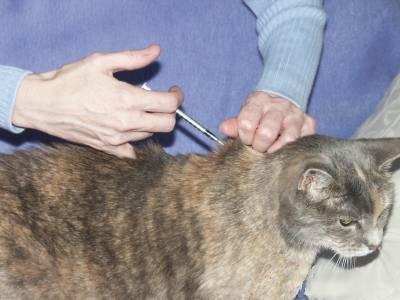 Interestingly, these "injecting" photos were the hardest to take, and my stunt-cat wouldn’t sit still. I think it’s because injecting is normally a quick two second job, over and done with, but for photos I was having to set up each stage, and Tokyo didn’t know what was going on and didn’t like it! One final picture of the actual injecting into the scruff of neck, this time from close up. As you can probably tell from the photos I am right handed. If you are left handed, print the page off and hold it up to a mirror to see how it would look from a left-handers perspective. Thank you to Tatty, our beautiful, reluctant star, for the pictures on this page. 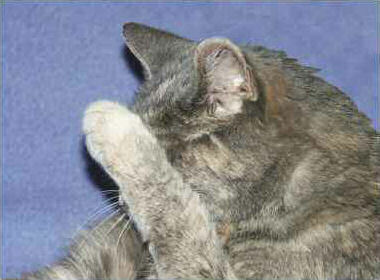 She’s quite a shy girl really! 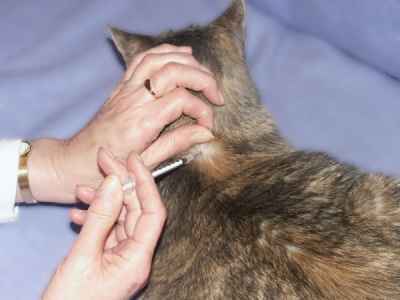 If these pictures didn't help enough, there is a short three-minute video on www.petstreet.co.uk on how to inject your cat.